The major trend in 2016 was one of increasingly apathy. 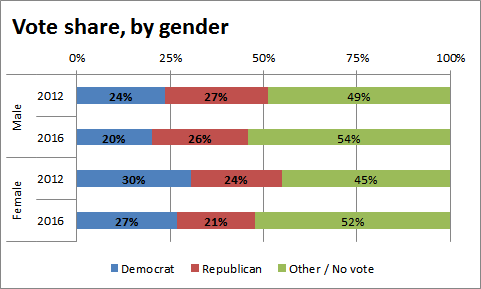 Within that broader trend, the demographic patterns are muddy. 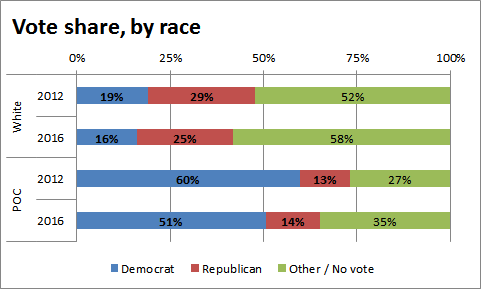 Deviations in relatively support from group to group don’t map well onto the standard media narratives that dominated this election; for example, apathy grew more among women and voters of color than among men and white voters. 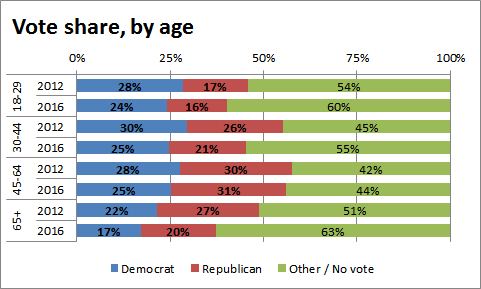 Among the candidates, Clinton either broke even or lost support among every single demographic group, while Trump won support among voters of color and boomers. Ultimately, Trump managed to stem his losses among men, the poor, and millennials – and among boomers and voters of color he actually improved the GOP’s numbers. Clinton, meanwhile, lost voters in every demographic across the board; she took major hits among voters of color and the poor, and only managed to minimize her losses among wealthier voters. 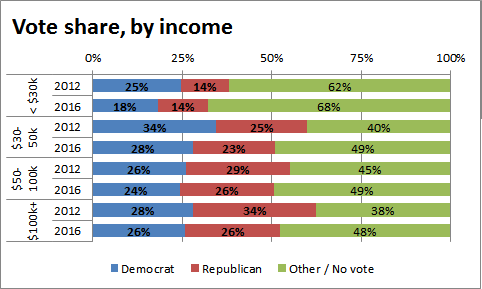 Trump took his largest hit among those same wealthiest voters, but it turns out that pandering to the rich while abandoning the poor just isn’t a winning strategy.